Heartwood Jennie Lynn Bird House-MADE IN THE USA BIRDHOUSE! 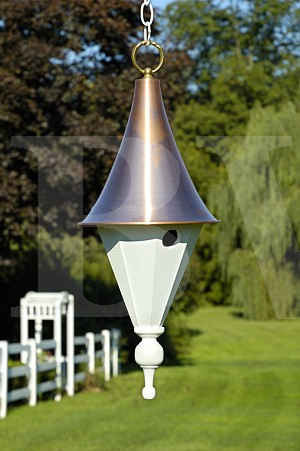 With a name inspired by the famous human songbird, this graceful octagonal beauty in white or mahogany puts elegance center stage with a turned finial, brass top ring and spun solid copper roof. Roof removes as easily as a lampshade for effortless cleaning. Get settled in--concerts are about to begin.